The seasonal destination of the world’s wealthiest, the jet-set and every star who’s set a stiletto-ed foot on the silver screen –for clientele alone, ski resorts are among the most prestigious destinations in the world. It’s not just a staunch love of skiing that’s kept generations of the rich and royal coming back–rather that these are some of the most glamorous establishments on earth. A combination of sumptuous venues, skiing institutions and the services we can’t quite believe exist – read on, for a survey of the 8 most luxurious things to be found in the mountains. The favourite haunts of food fans, any resort worth its salt has at least a handful of Michelin-starred restaurants. Megeve, similar to St Tropez in size, has an astounding 13 in the Michelin guide, among which La Ferme de mon Pére and the Flocons de Sel, have been awarded 3 stars each (2 of only 100 in the world). Head to the latter, for warm vegetable millefeuille and a smoked-cedarwood chocolate tart topped with wood-flavoured ice-cream – utterly delicious. Whether the spa or the film star was first to the mountain, today one is never far from the other. 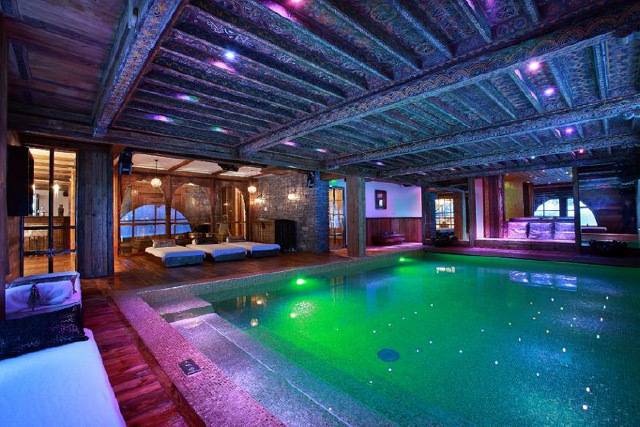 Stay in a 5* chalet, and chances are it’ll come with a set of personal saunas like Chalet Marco Polo. Visit a luxury ski hotel for wellness floors and swaths of specialist therapists, like the certified “aqua balancer” at the Salzburgerhof. Though, for utter mountain magic, it has to be one of the resorts fed by a natural hot spring, which are channelled into steaming thermal baths (and in the Thermal Spa Pulverer around a million different steam rooms). 24 hour concierges, personal chalet chefs, and residential nannies – you only have to blink in a ski resort to find yourself with more personal staff than guests. Intent on making theirs the vacation of your life, many luxury chalets offer 24-hour chauffeurs and your very own masseurs on call. Pick a pad like Whistler’s Fairmont hotel, or a chalet with a ski room, for a valet who’ll even polish and heat your boots for you. 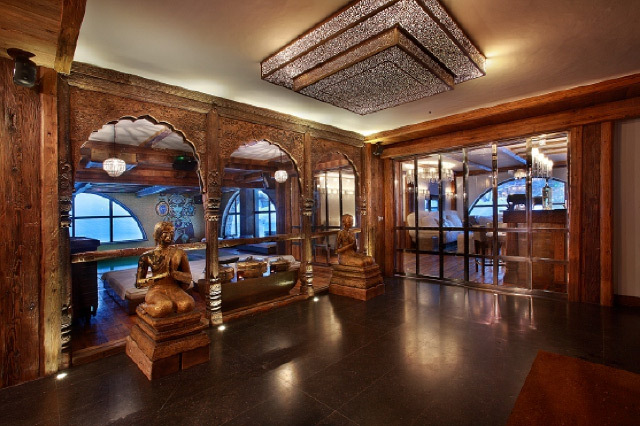 Nothing embodies wealth quite like the centuries old, invite-only clubs which are part and parcel of the older resorts. The “cradle of Alpine skiing”, St Moritz, has the most – with one for practically every activity on the mount –for lunching; the impenetrable Corviglia club, for partying; Guther Sachs’ Dracula Club, and for tobogganing; the 1887 established Cresta club. 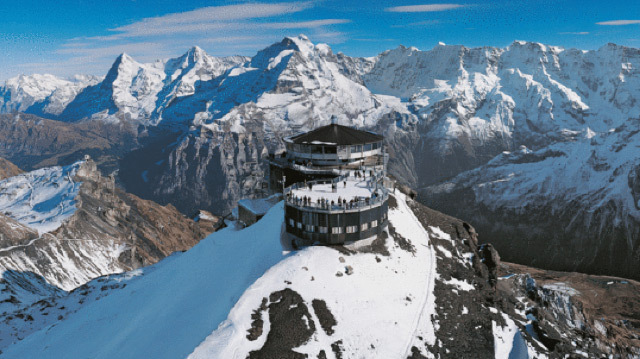 The Piz Gloria restaurant atop the Schilthorn serves indescribable champagne breakfasts, making a sonnet-worthy view that much more spectacular. It makes a complete rotation every 45 minutes, so you won’t have to move an inch to take in all 200 of the surrounding peaks. Heated, wifi-ed, lined in Italian leather, you name it; somewhere the ski cable car has it, including a BMW-designed cable car in Hochzillertal, which someone clever has fitted with massaging seats and a multimedia dashboard. It even has champagne holders – for when you’re indulging in one of its gastro-packages. Clients book weeks, even months, of “snowga” with Priska Holz or Sabrina Nussbaum (below) from the Suvretta ski school, to throw some spine re-aligning shapes on the Paradiso run just above St. Moritz – it’s the world’s first, though certainly not last, yoga piste. It was only a matter of time before real gold found its way into the chalet elite: Marco Polo leads the way, with a 24-carat pool area designed by Christian Lacroix. Joined by smoke machines, disco lights, a projector screen and a bar –Marco Polo pool parties are the stuff of luxury legend. And if spectacular pools are your thing, they’re certainly not in short supply – cast a glance over WeLove2Ski’s lux list. It’s a wonder anyone gets out on the slopes… If, like me, you’ve been mentally planning a ski holiday, head over to my friends at Sno.co.uk and plot your next luxury skiing adventure.